Spotting Carpenter Ants Early Can Save You Money - Yes Pest Pros, Inc. Spotting Carpenter Ants Early Can Save You Money - Yes Pest Pros, Inc. Many people do not recognize the warnings signs or serious risks of a carpenter ant infestation and fail to call a pest control service until after structural damage has already occurred in their home. If you know what to look for and call a pest control service in time, you can save money on costly repairs to wooden decks, beams, attics and floors. Carpenter ants burrow inside of wood, wherever it is located in your home. They do not prefer dry wood as a living environment and tend to be found in structural lumber. The damage they create as the hollow out the wood in your home is unmistakable and any pest control specialist can identify it. Targeting wood that is softened due to decay or moisture, carpenter ants can contribute to serious structural damage. It is a common misconception that ants eat the wood, but it is a different insect than a termite. Instead they move wood out of the way to create nests in the wooden structures. By doing this, the carpenter ant leaves behind piles of dust called frass that are visible to humans. A pile of dust left behind is a clear indication that you have a carpenter ant problem. Be careful not to confuse frass with sawdust, but if you notice traces call an pest control expert immediately. You cannot tell how bad the infestation is already and you certainly don’t want it to spread. The next thing to look for is an actual ant that may have wandered from the nest. To be sure it is a carpenter ant, you should consult a pest control expert. Killing these ants alone will not even begin to tackle your problem. Also, carpenter ants can search for food in places great distances away from their nests so it can be difficult to find the nest. 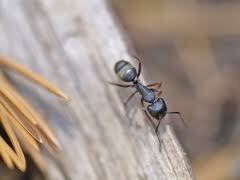 Another way to spot a carpenter ant is by trails that you can see on the floor and other surfaces. If you have seen frass or what looks like a carpenter ant, be sure to look behind furniture and even hard to reach places to check for trails. You can also hear carpenter ants inside their nests. Rustling noises can be faintly heard behind halls and in wooden beams. At this stage, an infestation is certain and you must call your pest control specialist. People often put off calling a Young Environmental Solutions pest control specialist because the carpenter ants are slow to cause harm, but if the problem remains uncorrected there will be serious damage to a home. Costly repairs to the damage of carpenter ants are common when homeowners do not take steps to get rid of the infestation immediately. It is easy to identify if you have carpenter ants, but it is nearly impossible to handle the problem without the help of a pest control professional that knows how to remove carpenter ants. To save money in the long run, treat you carpenter ant problem completely the first time by counting on the expertise of a carpenter ant removal & pest control service like Young Environmental Solutions!